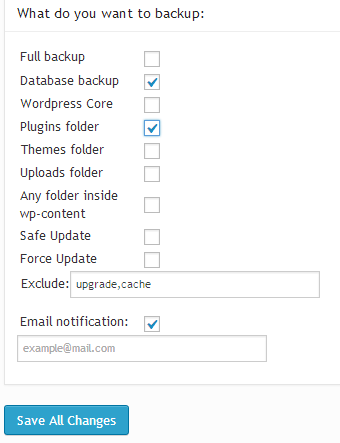 In order to create a WordPress FTP backup, open the Options tab and tick the needed backup options. Also, you can specify separate elements for backup. For example, you can back up the websiteРІР‚в„ўs database or plugins folders. 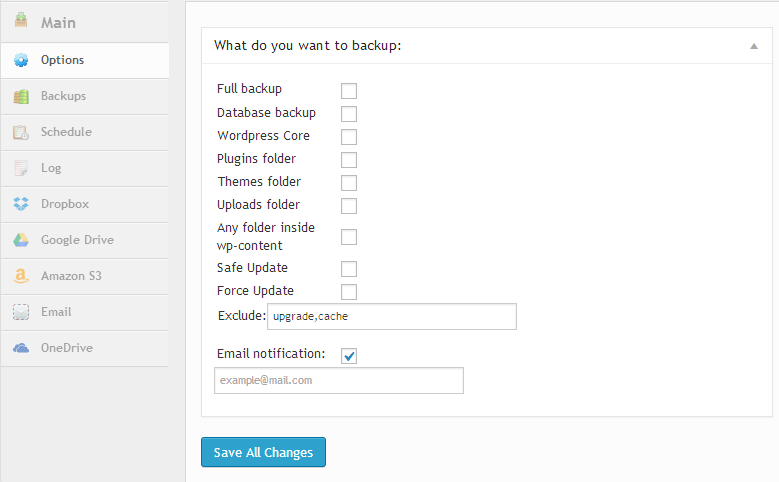 If you would like to be notified about your backups regularly, check Email notification and type in your email address. It is ABSOLUTELY IMPERATIVE that you press Save all changes after making configurations. Then click on the MAIN option, check FTP and press Save. Then press Backup Now and wait until the system completes backup. This may take 5 to 60 minutes depending on the size of the files incorporated in your website. Here you can restore or download your backup files. Since weРІР‚в„ўve been creating FTP backup, you can find your files in the \wp-content\upready\ – there youРІР‚в„ўll see files with backups.